Welcome to the official online guide to help you plan the perfect short break in Cheshire. Cheshire is an area bursting with things to see and do from amazing attractions to beautiful gardens, stunning stately homes to fabulous spa hotels, there is something for everyone. Chester is a classic, contemporary city bursting with must see treasures, 2000 years of history and spectacular shopping. 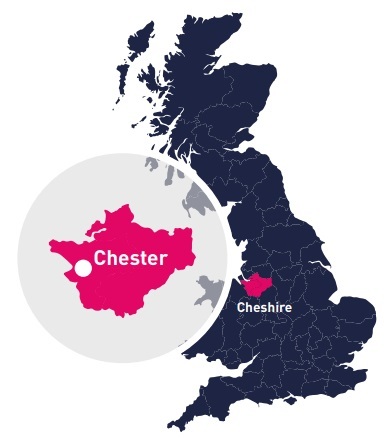 Visit Chester for a short break and choose from a fabulous range of accommodation, from luxury hotels to cosy self catering cottages, friendly farmhouses to campsites, you are sure to find something to suit you. Use this site to explore things to do, see what's on and book your tickets to Chester & Cheshire’s top attractions and events. Whether you are looking for the perfect city break or relaxing rural retreat, this is the place for you. What are you waiting for? Book your stay now! Looking to book accommodation in Chester or Cheshire? Find hotels, B&B's, rural farms, slick apartments, cosy cottages, campsites and more. Funtopia is a fantastic fun-packed event which is perfect for tots to tweens.